Cody McCasland, aged 7, from Texas, USA was born with no knee bones and had to have the bottom of his legs amputated as a toddler. This does not stop him from taking part in a large variety of sports and hobbies. The world`s most advanced, commercially available, bionic hand has clinched the UK`s top engineering prize. The i-LIMB, a prosthetic device with five individually powered digits, beat three other finalists to win this year`s MacRobert award. The technology has been fitted to more than 200 people, including US soldiers who lost limbs during the war in Iraq. The device started life in Scotland in 1963 as part of a project to help children affected by Thalidomide. The complex device finally went on sale in July 2007. It is produced by a company called Touch Bionics based in Mid Calder, Livingston. "It`s such a fantastic invention," Ray Edwards, a quadruple amputee and one of the first people in the UK to be fitted with the device, told BBC News. "When the arm was put on, I had tears rolling down my face. It was the first time in 21 years that I had seen a hand open. "I can do a thumbs-up, I can hold a pen and I can do many things that I couldn`t do before." The technology beat off three competitors to claim the Royal Academy of Engineering award at a ceremony in London. The other finalists included a robotic system designed to care for millions of biological samples in sub-zero temperatures; a chemical sensor which could detect early stages of disease and a compact soot filter for diesel cars. Psychologically, it has been the greatest thing. Physically, it`s hard to get things moving again. "Touch Bionics have fundamentally changed the benchmark for what constitutes an acceptable prosthesis," said Dr Geoff Robinson, chairman of the MacRobert Award Judging Panel. "Having tried it myself, I can vouch for the fact that it really does work in the way portrayed, even if one is fortunate enough to still have one`s own real hand alongside." The i-LIMB hand has advanced a concept first outlined by NHS researchers. 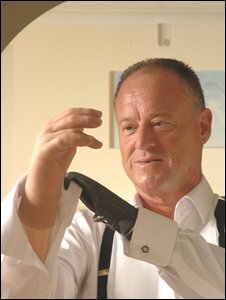 "The hand has two main unique features," explained Stuart Mead, CEO of Touch Bionics. "The first is that we put a motor into each finger, which means that each finger is independently driven and can articulate. "The second is that the thumb is rotatable through 90 degrees, in the same way as our thumbs are. "The hand is the first prosthetic hand that replicates both the form and the function of the human hand." Other companies and organisations, such as the US space agency (Nasa) and the country`s military research arm, Darpa, have developed more advanced hands. "All of those are laboratory-based - ours is commercially available," said Mr Mead. The hand does not require surgery to be fitted to the patient`s stump, according to Mr Mead. "There are two electrodes that sit on the skin that pick up myoelectric signals," he explained. These impulses are created by the contraction of muscle fibres in the body. "They are used by the computer in the back of the hand, which does two things: it interprets those signals and it controls the hand," he told BBC News. The prosthetics have been fitted to more than 200 patients around the world, including Mr Edwards who is CEO of the Limbless Association. "I`d love to get another one," he said. "Psychologically, it has been the greatest thing. Physically, it`s hard to get things moving again." Mr Edwards likened wearing the hand to "carrying a brick". However, he said, the benefits far outweighed any negatives. "I`m very fortunate," he said. The firm is now looking to improve the design of the i-Limb as well as expanding its range of smart prosthetics. "We are working a full-arm system - we have a prototype wrist, elbow and shoulder," said Mr Mead. The i-LIMB will be on display at the Science Museum in London from 12 June.